Potassium chloride is a logical alternative to sodium chloride in water softening. Water Softening with Potassium Chloride provides a thorough overview of the process, the equipment, and the techniques used. Then it compiles diverse trade and technical data on water softening with potassium chloride so readers can make informed decisions. 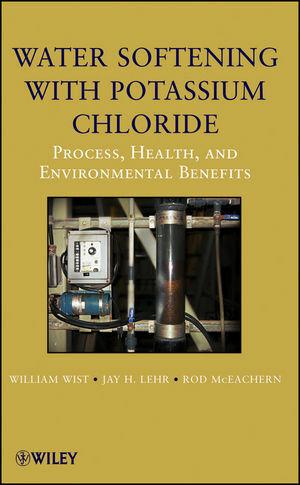 It documents the health and environmental consequences and benefits of using potassium chloride and includes a chapter with summaries of recent research projects and FAQs. This is a key reference for professional water treatment specialists, environmental science researchers, and others. WILLIAM WIST (deceased) spent eleven years at Central Canada Potash as a lab technician, senior chemist, and chief chemist. After joining Potash Corporation of Saskatchewan Inc. in 1980 as chief chemist, he set up and equipped a new research and development laboratory for them. From 1988 until his retirement in 2005, he was chief chemist and pilot plant supervisor. Bill spearheaded the research and development of the use of potassium chloride as a water softening regenerant, in addition to other projects involving potash product quality and analytical procedures. JAY H. LEHR holds a PhD in environmental science from the University of Arizona and an engineering degree from Princeton University. He is the author of twenty-eight books and over 600 journal and magazine articles. He has taught at the University of Arizona and The Ohio State University, directed a professional society of environmental scientists, and formed a variety of environmental teaching and consulting firms. ROD McEACHERN holds a PhD in chemistry from the University of Saskatchewan. He currently works as the Director of R&D with the Potash Corporation of Saskatchewan Inc. in Saskatoon, Canada. His research interests include the application of new technology to environmental stewardship through improved air pollution abatement equipment, improved waste management practices, and process improvements to potash operations.